The effects of a concussion can be serious, and in some cases even life threatening. It can affect memory, judgment, reflexes, speech, and muscle coordination, and in rare cases, a blood clot may even form. Due to the complexity of the brain, every brain injury is different, making the diagnostic process challenging. Signs and symptoms of a concussion can be subtle, and assessing the severity of the injury, whether or not it is life threatening, is difficult. 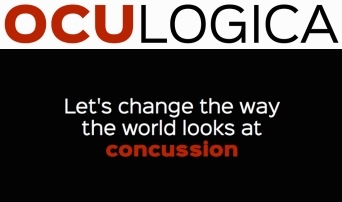 The New York-based startup Oculogica is developing neurodiagnostics with a primary focus on concussion. Their novel eye-tracking device works by having patients watch a music video for a few minutes while eye movements are measured using a tracking camera. They have found that the ratio of horizontal to vertical eye movements are close to one-to-one in healthy patients, and have developed an algorithm that convert the eye-tracking data into accurately identifying who has a concussion or not. In addition, the device is also able to quantitatively measure the severity of the concussive status. In early tests, the device had an optimal sensitivity of 88% and specificity of 87%. The innovative technology enable a more precise definition of concussion which will allow healthcare providers to rapidly, noninvasively and objectively quantitate the extent of it. Brain injury is the number one cause of death and disability in people under the age of 35, and many of these injuries do not show up on any scans. By more accurately diagnosing concussion and its severity, we can better treat it and speed the recovery process. The testing is extremely quick and inexpensive, and does not require any reading or language skills, which makes it useful in multiple patient populations. The device could have multiple applications. Concussions caused by contact sports have become a growing epidemic among young athletes, and if left untreated could result in long-term brain damage. Some athletes may downplay symptoms in order to keep playing, and having Oculogica’s technology on the sideline could potentially prevent brain injuries. In addition the technology could have a huge potential in emergency rooms and emergency ambulances, providing a quick and efficient assessment of the potential injury, and even in primary care settings. Oculogica has previously won the NUY Venture Technology Competition, and was named the Best in Show at the Mid-Atlantic BioAngels First Pitch Life Sciences Event. It has also been awarded $15,000 at Innovate Health Tech NYC, and a $250,000 grant from the National Space Biomedical Research Institute to help investigate whether eye tracking can accurately assess the impact of elevated intracranial pressure. Earlier in 2016, Oculogica was admitted to the Stanford accelerator StartX.